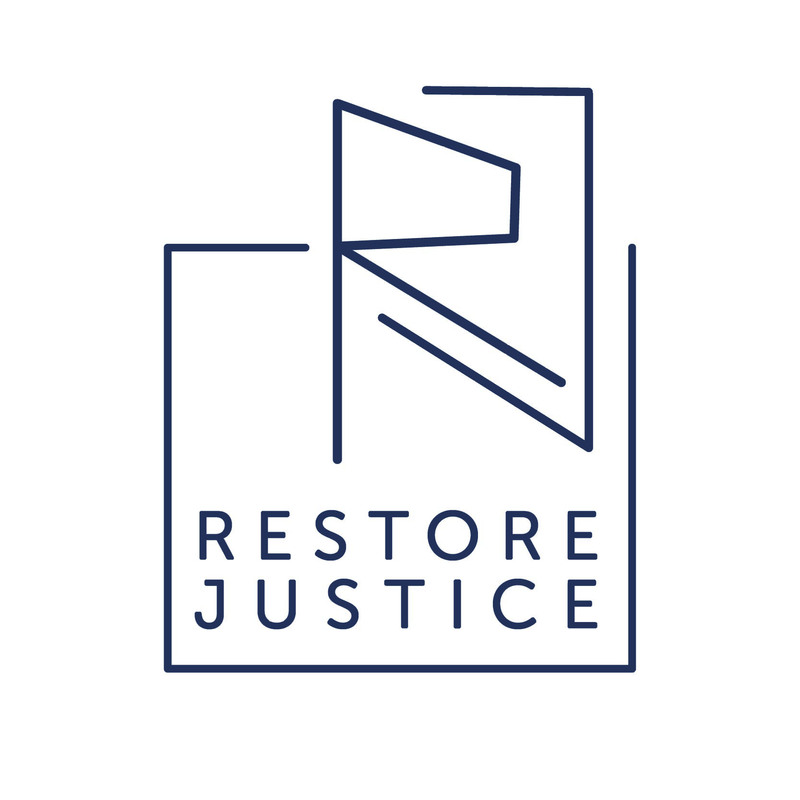 At Restore Justice, we focus our advocacy and legislative efforts on individuals and communities most extremely impacted by the shortsighted policies of the tough-on-crime era. 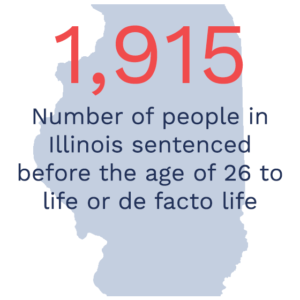 In Illinois today, roughly 1,900 individuals taken into custody before the age of 26 are serving sentences of life and de facto life in state prisons, defined by the U.S. Sentencing Commission as termed sentences longer than 40 years. That’s about 4.5% of Illinois’ prison population. Each case and person is unique, and few statements can describe all individuals serving extreme sentences. That said, knowing at a broad level who bears the burden of the state’s most extreme sentences helps us understand the issues, craft more nuanced policies, and build common ground for dialogue between communities, advocates, and legislators. Here’s what we know about this group of individuals. 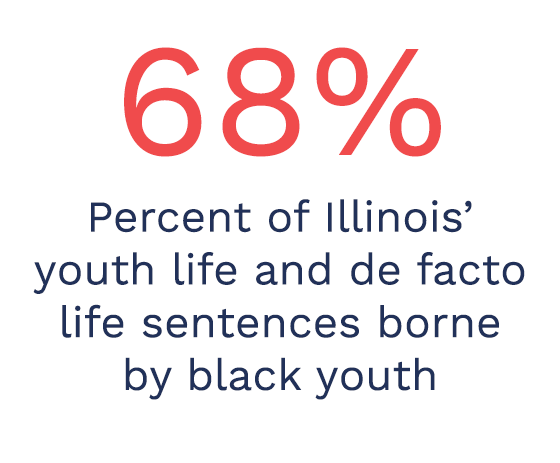 Overwhelmingly, the individuals in Illinois serving life and de facto life for offenses before the age of 26 are young black men from Cook and its neighboring counties. 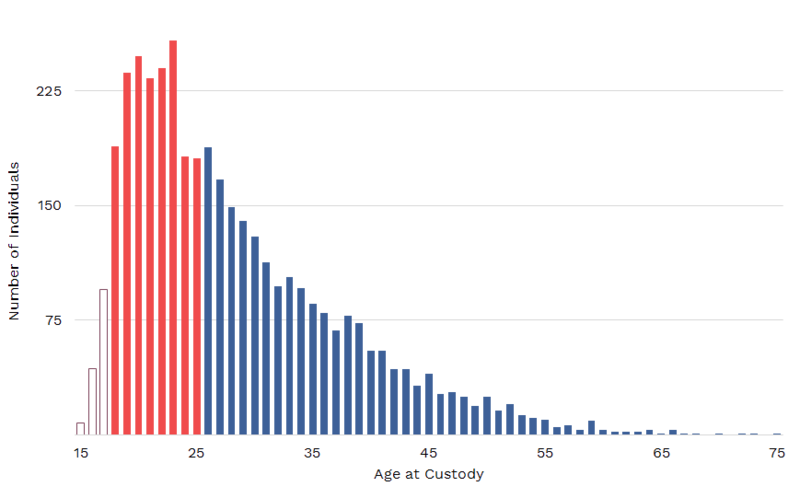 Figure 1 shows the distribution of sentences by race, compared to Illinois demographics. 72 of the state’s 102 counties have sentenced at least one currently serving person to life or de facto life for an offense before the age of 26. 66% of all sentenced individuals are from Cook County. About 96% of youth life and de facto sentences are for homicide-related offenses. Caption. Data were sourced from IDOC’s public report on prison population as of June 30, 2017 and the U.S. Census. 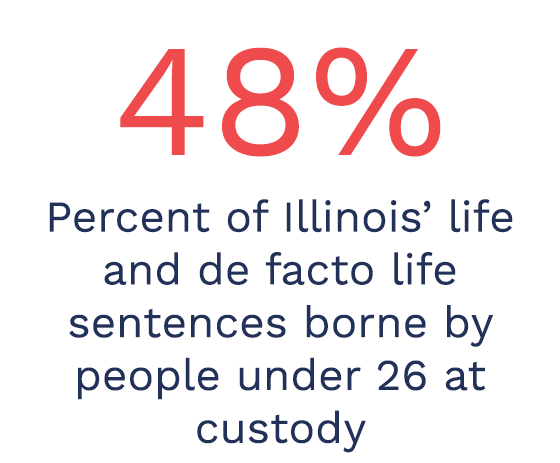 Almost half (48%) of all individuals sentenced to life and de facto in Illinois entered custody before the age of 26. About 1 in 5 (21%) entered custody before the age of 21, some as young as 15 years old: too young to drive a car or vote. Roughly half (49%) of the individuals currently serving youth life or de facto life received their sentences before 2004. 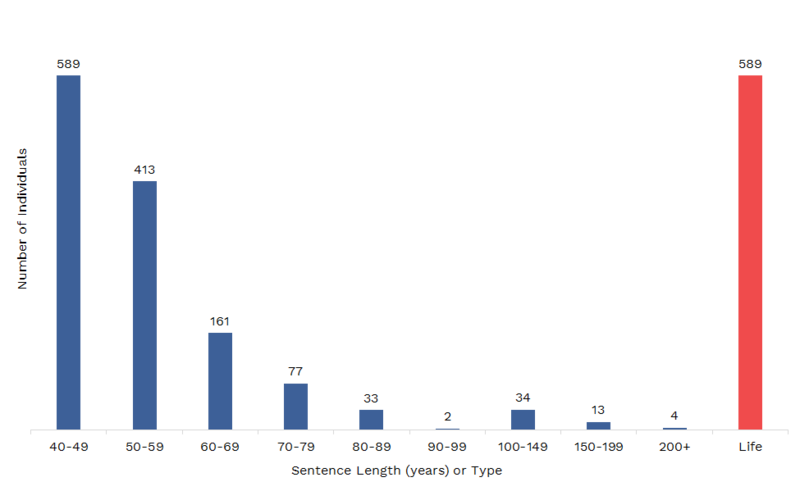 Figure 2 shows the distribution of ages when individuals were taken into custody. Figure 3 shows the distribution of sentence year for the current population of serving individuals. Caption. Data were sourced from IDOC’s public report on prison population as of June 30, 2017. Figure does not include sentenced individuals who have left IDOC custody as of June 30, 2017. 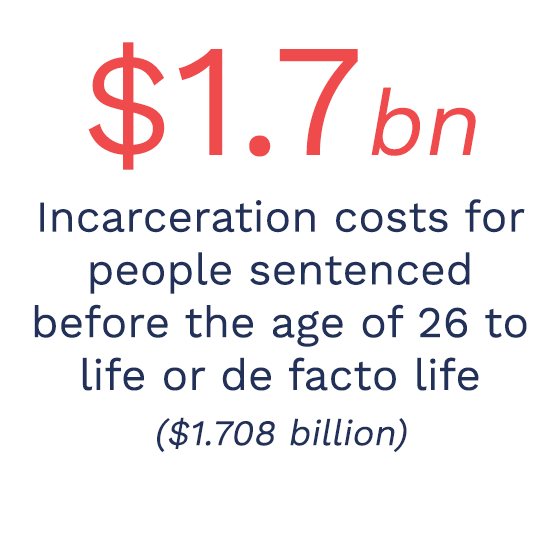 Based on current costs of incarceration and their remaining sentence lengths, keeping these individuals in custody for the remainder of their sentences could cost Illinois in the neighborhood of $1.7 billion. Even among extreme sentences, length and type of sentence can vary substantially. About 31% of sentences are life sentences. Among non-life sentences, the median sentence length is 50 years. Figure 4 shows the distribution of these sentence by length and type. Caption. Data were sourced from IDOC’s public report on prison population as of June 30, 2017. 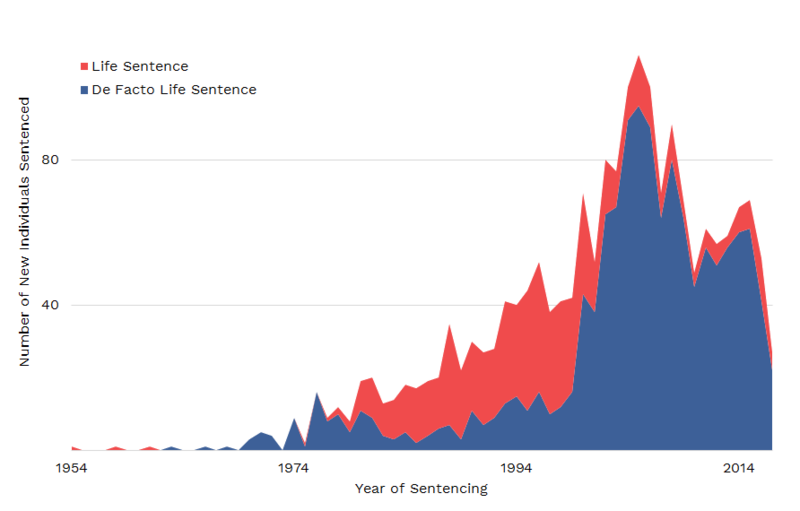 Sentence lengths assumed earliest possible release due to good time and truth-in-sentencing modifications (e.g. an individual with a 90-year, day-for-day sentence was reported as having a sentence length of 45 years). 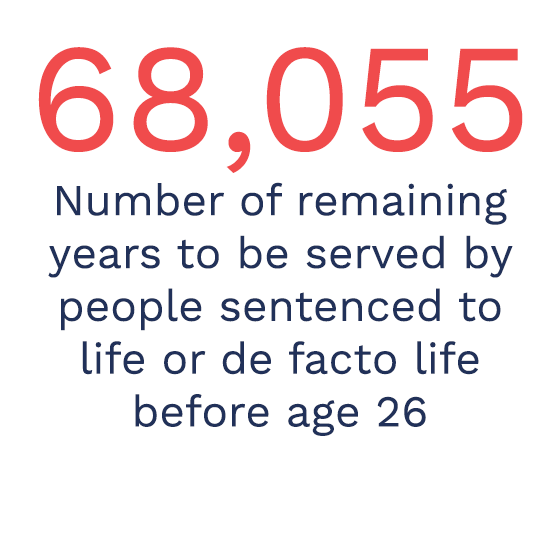 The individuals currently serving youth life or de facto life sentences will serve about 68,000 more years, assuming earliest possible release and a life expectancy of 80 years. Because they enter younger, those serving youth life or de facto life sentences will tend to serve longer sentences than older adults sentenced for the same offense, despite the diminished culpability of youthfulness. Young people with life or de facto life sentences will serve a median of 38 more years in Illinois prisons. Those serving these sentences for offenses committed after the age of 25 will serve a median of of 32 more years. Data were sourced from the Illinois Department of Corrections (IDOC) records dated June 30, 2017.  To determine the target subset of individuals, Restore Justice identified individuals who were (1) taken into IDOC custody before age 26 and (2) sentenced to life OR a term of 40 years or more after accounting for possible earned time and truth-in-sentencing modifications. For example, an individual who entered IDOC custody at age 22 to serve a 60 year sentence under a day-for-day program would NOT be included in our analysis, while an individual sentenced at age 24 to serve 45 years under a 100% truth-in-sentencing program would. Total remaining years were determined by calculating two values for each individual: (1) the time until earliest possible release based on maximum available earned time, and (2) the time until an individual turned 80. Restore Justice then chose the smaller of the two values to allow inclusion the contribution of life sentences and reflect life expectancy. For example, Restore Justice would calculate that an individual admitted at 15 and sentenced to serve 200 years would serve at maximum 65 years, not 185. Total incarceration costs were determined for each IDOC facility by multiplying remaining years to be served by individuals held at that facility by that facility’s average annual cost per inmate for fiscal year 2016, which are reported by IDOC on each facility page.